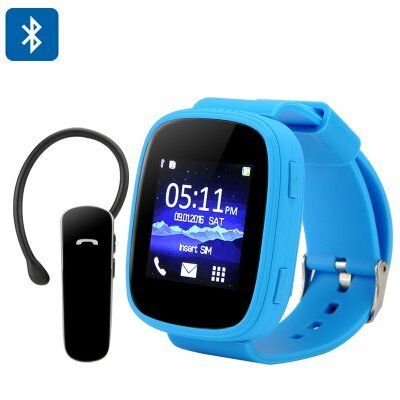 Successfully Added Ken Xin Da S7 GSM Smart Watch - 1.54 Inch Touch Screen, Bluetooth, Heart Rate Monitor, SMS Sync, FM Radio (Blue) to your Shopping Cart. Receive messages and make calls right from your wrist with the Ken Xin Da S7 GSM Smartwatch. Supporting quad band frequencies on the GSM network, this simple accessory doubles as a phone and also features a heart rate monitor, SMS sync, and music play. The Ken Xin Da S7 is not only a functional smart watch — thanks to the support of a GSM SIM card, it can also double as a mini cell phone. So, if you are in a rush or simply don’t want to take out your phone, you can handle all your calls right on your wrist. With Bluetooth support, the cell phone watch can easily connect to other devices, including, of course, your smartphone. Hook it up for more functionality and enjoy SMS syncing, notifications and music play. If you’ve been long planning to get back on track with your workouts and exercise more, the Ken Xin Da S7 will be of great help in this department as well. Coming with a heart rate monitor, it can help monitor how your body responds to different intensity workouts. The 1.54 inch touch screen provides a convenient interface for interacting with your smart accessory while a stylish compact design and an adjustable bright blue wrist strap make for funky good looks. Enjoy loads of functionality on the go! The Ken Xin Da S7 GSM Cell Phone Watch comes with a 12 months warranty, brought to you by the leader in electronic devices as well as wholesale GSM watch phones..